In building up the image of actress Sophia Loren, Vittorio De Sica undoubtedly played an important role. 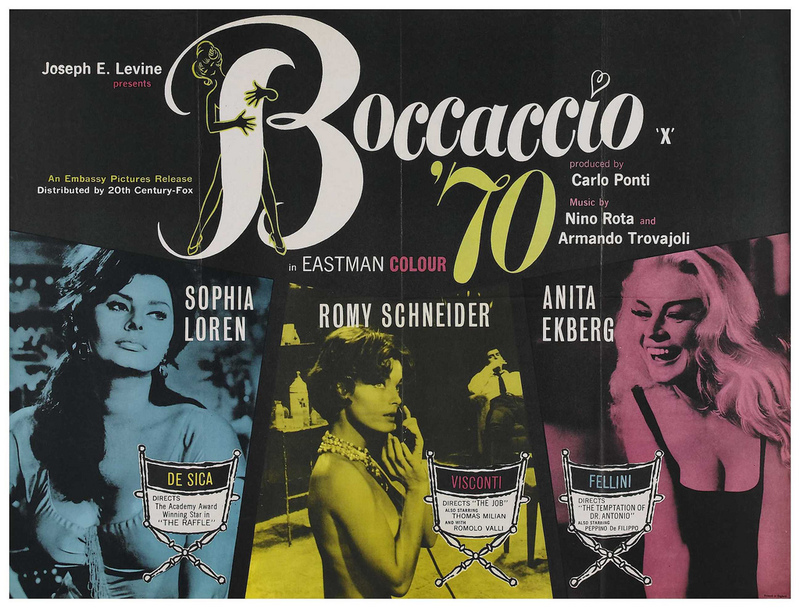 After the dramatic LA CIOCIARA (THE CIOCIARA GIRL, U.S. title: TWO WOMEN), which is of no interest here, he carried forth, always with the help of a Zavattini script, the figure inaugurated by the "pizzaiola," adding brilliant new touches in La Riffa (The Raffle), the first episode of BOCCACCIO '70, a risque story located in Romagna during a village fair, where a woman of the "shooting gallery" is secretly put up for auction, but, being in love with a young swain, refuses in the end to give herself to the winner. The slightly acrid story abounds in peasant humor and could not be understood outside that particular geographic framework. 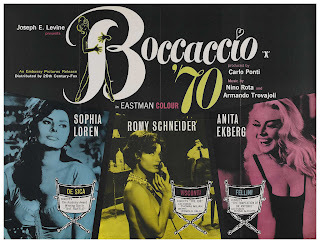 IERI, OGGI, DOMANI (YESTERDAY, TODAY, TOMORROW: 1963) shows Sophia Loren in three different roles: Adelina in the first episode, written by Eduardo De Filippo, Anna in the second, based on a Moravia short story, Maria in the third, written by Zavattini. Particularly memorable was Adelina, which describes the curious situation, based on a true story, of a common woman in Naples, married to a longshoreman and a clandestine vendor of smuggled cigarettes, who, in order to avoid being arrested, takes advantage of the deferment of sentence provided for by the law for anyone expecting a child. So that if Adelina wants to stay out of jail, she is forced to have one baby after the other. The last episode film directed by De Sica on a script by Zavattini was WOMEN TIMES SEVEN/SETTE VOLTE DONNA (1967), but it was a vehicle for seven different cameo performances by Shirley MacLaine.